Randi is a Certified Yoga Therapist (CYT-1000) through Yoga Therapy International (YTI); is registered as an Experienced Yoga Teacher with Yoga Alliance (E-RYT); and is a Registered Holistic Nutritionist. She also holds a Bachelor of Science in Biology and Psychology from McMaster University. After years of working as a research chemist in the pharmaceutical industry, she grew tired of the reactionary approach of the allopathic health field. It was then that she decided to switch her focus to health promotion and disease prevention to help people live a healthy and active life, free from a dependency on medication whenever possible. This holistic way of living is intended to empower people with the knowledge of how whole foods and mindful movement can sustain a healthy and whole body. 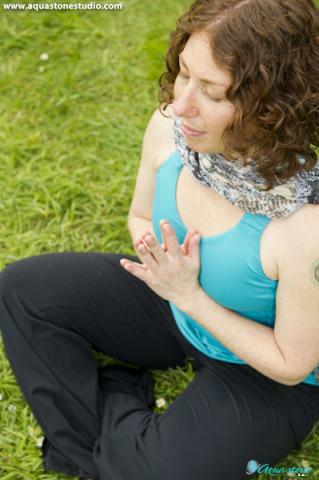 As an active member of the International Association of Yoga Therapists (IAYT), she believes that Therapeutic/Restorative Yoga and Yoga Nidra is not only for those with physical or emotional symptoms, but also for anyone wanting more personalized attention to help them begin a new practice or deepen an existing one, helping them along their journey towards finding their true selves. She mindfully guides her students through their practice, encouraging joy and love, and helps them create a calm and open environment in which to renew. She strives to help her students bring a conscious awareness to the mat and beyond and, ultimately, the greatest gift ― self acceptance. Overall, her goal is to help people learn how to relax and live a healthier, happier life, at peace with themselves and their surroundings. Randi continues her studies with Maggie Reagh, Founding Director of YTI, and with master teachers, including Richard Miller.